LG’s G3 smartphone is this year’s hit. It’s the first phone from the Korean electronics giant that can go toe-to-toe with the best of the rest. Now the company is looking to G3’s UX on its cheaper devices. One of the reasons behind the G3’s success appears to be the user interface enhancements that LG included. 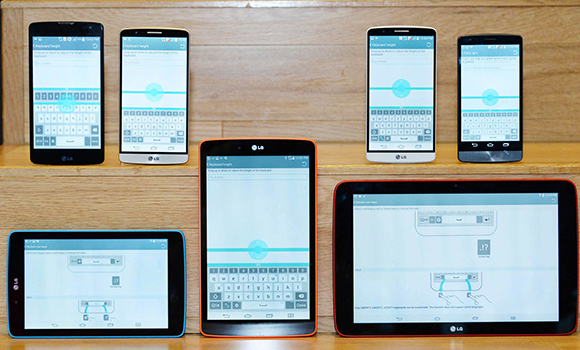 The “dramatically simplified” interface, compared with the earlier LG G2 is a hit with G3 users. Now, the company says in a press release (see below) that it will be making that interface standard across many of its smartphones and tablets. Specifically, LG will bring a few enhancements to its mid- and entry-level devices. For example, it will be including a simplified camera interface that displays only the most common menus. Its phones’ cameras will also include the G3’s “Touch and Shoot” feature, which lets people focus and shoot a picture with a single tap anywhere on the display — instead of first tapping on the screen to focus on a point and then pressing another onscreen button to snap the photo. Jong-seok Park, president and CEO, said. SEOUL, Aug. 19, 2014 ― From entry-level to premium, LG has been actively working to provide a consistent and uniform user experience (UX) across its entire mobile product lineup. Toward that end, LG Electronics (LG) will begin standardizing its proprietary UX features, first introduced in the new LG G3, across most of the company’s mid- to entry-level smartphones and tablets launched in the second half of this year. Since its worldwide unveiling in May, the LG G3’s UX features have been positively received by both customers and industry experts with many bestowing high praise for its user-friendly enhancements. The 2014 Red Dot Communication Design Award judges also applauded the LG G3, with a total of three “Best of the Best” awards for its intuitive UX features. A simplified camera displaying only the most frequently used menus is one of the UX features that will be standardized across mid- and entry-level LG smartphones. One of the key camera features is Touch & Shoot, which helps capture special moments quickly and intuitively by letting users tap anywhere on the display to focus and trigger the shutter in one single step, eliminating a time-consuming two-step process. Gesture Shot makes taking selfies simple and fun. Opening and closing one’s hand in front of the lens starts a three-second countdown before triggering the shutter for brilliant, blur-free selfies. Clean View offers a full, clutter-free preview interface by removing all camera menu icons from the screen. Another UX feature to be standardized is Smart Keyboard, which reduces input error by up to 75 percent by tracking and analyzing typing habits and intuitively “knowing” what words the user intended to type. The keyboard can be re-sized to better fit the user’s hands and thumbs. Suggested words, which appear above the keyboard, can be entered with just an upward flick of the thumb. Individual keys can be customized with frequently used symbols for even faster input. Long-pressing the space bar and sliding the thumb or finger left and right repositions the cursor for faster editing.